After being ordained a priest for the Diocese of La Crosse by Bishop John Patrick Treacy in 1950, Father Joe was first assigned as temporary assistant pastor at St. Paul Parish, Mosinee in and as assistant pastor at St. Hedwig Parish in Thorp. The following year, for his final assignment in the diocese before his first assignment as a missionary priest, he was appointed assistant pastor of St. Peter Parish in Stevens Point. While serving at St. Peter Parish, Father Joe heard a visiting bishop make an appeal to support the foreign missions and the desperate need for priests in Bolivia. The bishop encouraged Father Joe to visit Santa Cruz, Bolivia if ever he had the opportunity. The invitation served as the right sort of yeast to activate his promise as a seminarian to our Lord. Subsequently, he submitted a formal request to become a diocesan missionary in South America. Seeing prudence as the better part of action, Bishop John Patrick Treacy counseled the young priest to take a year in prayer while continuing his service in the parishes to determine whether this was truly God’s will for his priestly ministry. A year later, his desire to serve as a missionary burned stronger than ever, Father Joe returned to the bishop and resubmitted his request. In retrospect, he had the pope on his side at this time too. In 1957, Pope Pius XII published his encyclical “Fidei Donum” (“Gift of Faith”), which addressed the needs of the Church’s missionary territories throughout the world and served as a personal call from the pope to do exactly what Father Joe proposed the year before to Bishop Treacy. The encyclical also encouraged diocesan bishops to share their priests generously with missionary territories. In 1956, the faraway land of South America would not seem so far anymore to Father Joe as he was released from his diocesan duties to go to Santa Cruz. Arriving in Bolivia later that year, Father Joe became a trailblazer of missionary work in that country. Handed a machete by Bishop Charles Brown Auxiliary Bishop of the Diocese of Santa Cruz, Padre Jose joined the bishop in hacking through the jungle until they found a fit place to build a church. “Build a church here,” Bishop Brown said to Padre Jose, “and the people will come and build their homes next to it.” Today, helping to support a burgeoning population of 1.2 million people, the Parish of the Holy Cross is not far from the urban center of Santa Cruz. Padre Jose first built Holy Cross Parish in Bolivia, and a rectory and school for the parish, and then served the parish for the next 10 years. However, but before he left Bolivia, the seeds were planted for his next mission to South America. Attending a Eucharistic Congress sponsored by the Diocese of Santa Cruz, Bolivia, he met the Archbishop of Lima, Peru, who invited Padre Jose to come to his archdiocese if he were ever to return to South America. He returned to the Diocese of La Crosse in 1966 and was appointed administrator of St. John Parish in Heffron; and Guardian Angels Parish in Almond. Three years later, he was also appointed administrator of St. Martin Parish in Buena Vista. He also became Associate director of the Migrant Worker Apostolate in the diocese. Later that same year, 1969, Father Joe returned to St. Hedwig’s for his first assignment as a pastor. In 1971, taking up the archbishop of Lima’s invitation, he returned to missionary work, this time in Lima, Peru. Nine years later, through his own efforts in cooperation with God’s grace, he was named pastor of a new barrio on the outskirts of Lima: Villa El Salvador (City of the Savior). 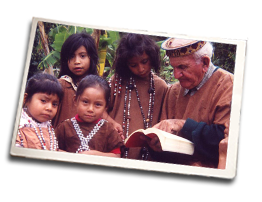 Turning the Villa El Salvador Parish over to two young Peruvian priests in 1986, Father Joe purchased five acres of land in the town of Lurin, Peru, to build an orphanage. 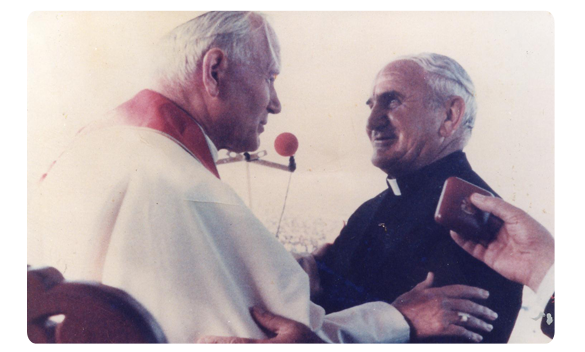 When Pope Saint John Paul II visited Villa El Salvador in 1987, he gave $50,000 for work among the poor. The cardinal and clergy of the city voted to give the money to Padre Jose for his orphans’ home. The orphanage was named Casa – Hogar Juan Pablo II, which translates “House – Home of John Paul II,” and used his beloved Father Flanagan’s Boystown as its model for administration and service to the children. Father Walijewski ran Casa Hogar Juan Pablo II until the year 2000 when he turned the orphanage over to a younger priest, Father Sebastian Kolodziejczyk, also of the Diocese of La Crosse. Padre Jose, who was 76, was not done. He moved to Oxapampa, Peru, where he lived at a house with adults that had grown up at Casa Hogar. He helped establish a home for the elderly to be staffed by consecrated women religious and drove into the rain forest on Sundays to celebrate Mass for the small communities of Ashiko Indians. 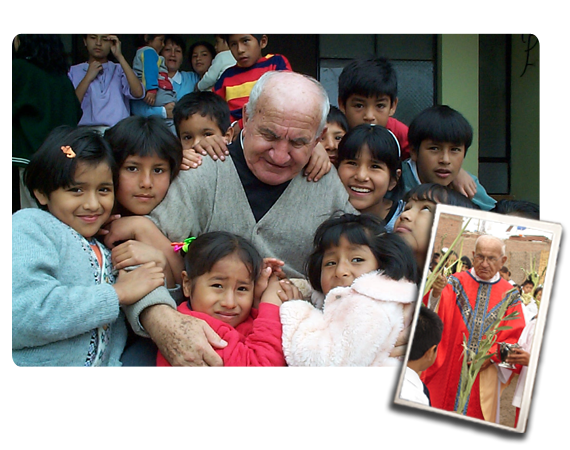 Padre Jose died as he wished – while working among the poor. Shortly after celebrating Palm Sunday Mass at Casa Hogar, he became ill. He was taken to a hospital in Lima where, two days later, he passed away of pneumonia and acute leukemia on April 11, 2006. On May 18, 2006, brother priests, family and friends from the diocese gathered at St. Joseph the Workman Cathedral in La Crosse for a memorial Mass and to pay their last respects to their beloved Father Joe. The homily was delivered by then-Father Roger Scheckel.